We are full on in the midst of the holiday season. Drizzle Kitchen has been slammed since before Thanksgiving and the end in sight is on December 26th. This means early mornings, busy days, kitchen time, office time, shopping time and then in the middle of there I’m trying to nourish my body, exercise, sleep 7 hours per night and still be jolly and merry and have time to celebrate the season with friends and family. That’s a pretty tall order! But there are some things that I know I can tackle. On the days I can’t make it to a class or the gym I do 3 x 1 minute planks before I get in the shower or I do three sets of situps and pushups. I make myself drink 8 glasses of water/herbal tea daily. I write in my gratitude journal every night. But I also really have to plan out my meals, something that I rarely do during a normal week. I’m lucky that I can just open the fridge and pop something together…..not when I’m busy though! I need to grab and GO! So I find myself making things like chia seed pudding, breakfast frittatas, extra chicken for dinner to have for lunch the next day on a salad, etc. But lately I’ve been making spring rolls! They’re such a fun fresh treat to open the refrigerator and have at the ready. Plus, they’re really a vessel for anything you have leftover in the fridge. Of course you can plan out what you want to wrap up which is fantastic but this time of the year I just want to plug and chug, open the fridge and pop in there whatever veggies I can slice and herbs I can snip. Luckily we always have avocados, herbs and a myriad of veggies. 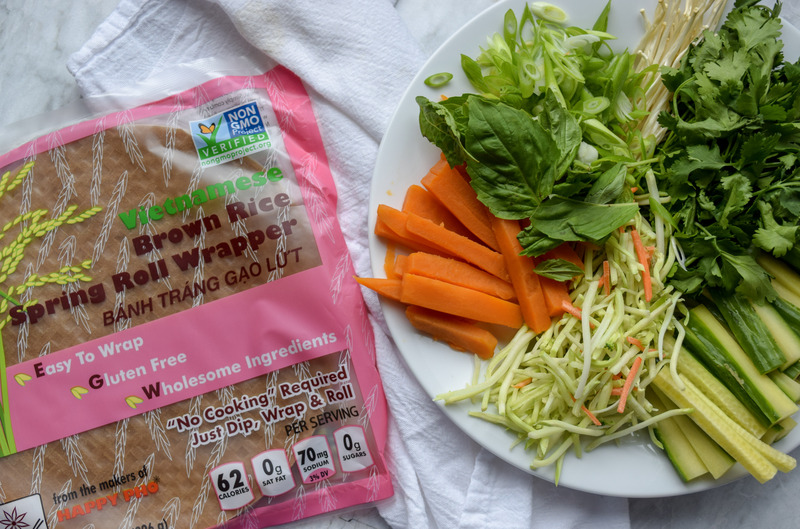 I also found, instead of white rice paper, a new brown rice paper to wrap the veggies in! It soaks easily, holds up to the filling and tastes delicious. More fiber and the same taste? Thank you! 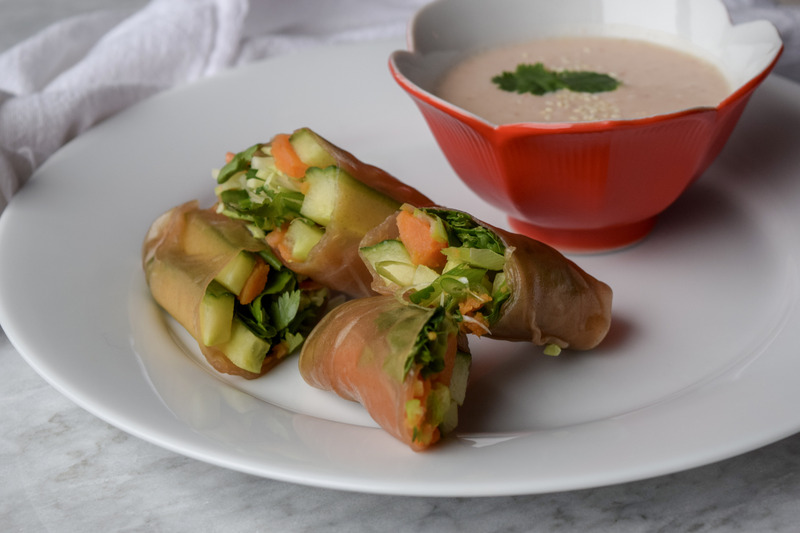 So when you are planning your snacks and meals for the week why not try spring rolls? They’re a deliciously fresh meal in the midst of our hearty holiday celebrations, not to mention fun to make and eat with your family! Happy eating is the best kind of eating! Arrange your wrappers, a bowl of warm water and a clean lint free towel in front of you. Lay a spring roll wrapper in the bowl of water and let it sit until softened, about 20 seconds. drape onto the towel and unroll the edges, if needed. place your fillings on 1/3 of the wrapper, off to one side. 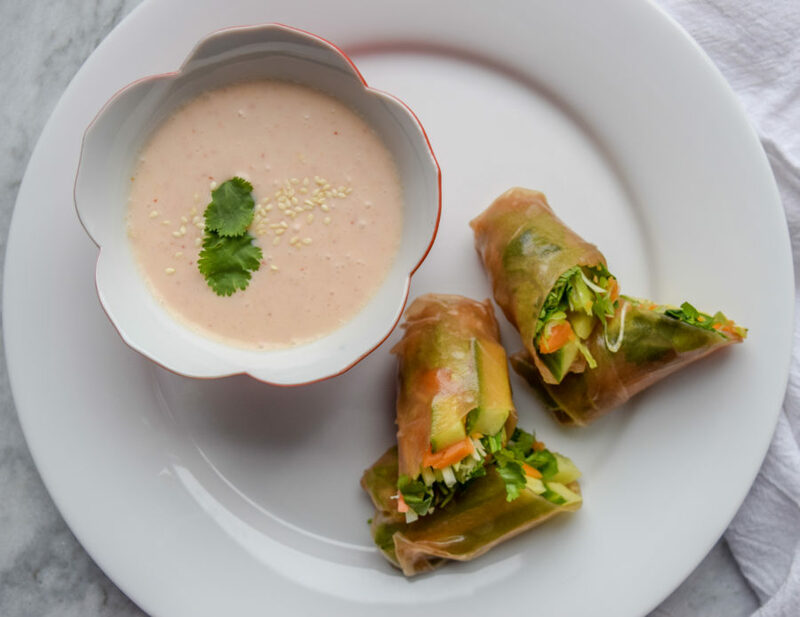 Mix together the dipping sauce (you might need a pinch of salt or sugar depending on your preference) and serve with the spring rolls!